"It perfectly matches an issue I'm working on right now," said Lutskovsky, who likes the DevSummit's educational aspects. "It was really good to get one-on-one time with Esri developers and learn some new skills with new technology." "We've been lifting up the hood of the platform and making it a strong platform for developers," Dangermond said. "This has meant opening up a lot of things—opening up some of our software to open source with GitHub, opening up our data models with open data programs and applications, and also opening it up for easy configuration and development with lots and lots of resources for developers." That's what Jessica Altamira plans to do with ArcGIS. She attended DevSummit to get training and tips on how to develop a web app for a resort owner on Long Caye in Belize. Altamira is a student in the master of science GIS program at the University of Redlands in California. For a school project, she will develop an online app that will help the resort publicize the island's ecologically valuable areas to potential visitors. The features she will map include mangroves, coral reefs, and lagoons. "I would like users to be able to zoom in to their area of interest and view the vegetation layers with pop-up windows containing pictures of the area," Altamira said. "A basic knowledge of widgets and web design is a must for my project," Altamira said. Altamira said she also may use ArcGIS Online to create Story Map apps for Long Caye, which is near the famous diving site the Great Blue Hole. "User-friendly maps are always a good promotion technique for vacationers seeking a tropical island getaway," Altamira said. Roldos is using the Geotrigger SDK to develop a location-based service to advertise concerts and sales at record stores in and around Los Angeles, California. "I have set up a framework for an iPhone application targeting small record stores and live music venues in the LA basin," Roldos said. Here's his idea: With the app on their smartphones, users would receive an alert that notified them about a concert at a music venue or a sale at a record store when they entered a specified geographic area or "trigger zone" near the venue or store. "For example, a record store in Long Beach may have a 40 percent markdown on vinyl records on [a certain] day," Roldos said. "A trigger can be set up around the store and its vicinity to alert passersby of this sale without using flashy signage, e-mail blasts, paper flyers, or other forms of marketing." "With my app, the concertgoer or record buyer is empowered by his or her location and proximity to participating stores and rewarded with a coupon or markdown on ticket price," he said. "The power of where supersedes the power of, say, a large customer e-mail database or flashy signage. With so many people using smartphones to make decisions on entertainment and shopping, an application using the Geotrigger SDK hits the nail on its head in terms of providing a customer or concertgoer with an experience that is relevant and redeeming." Roldos said he left Palm Springs armed with the information he needed to build the location service. 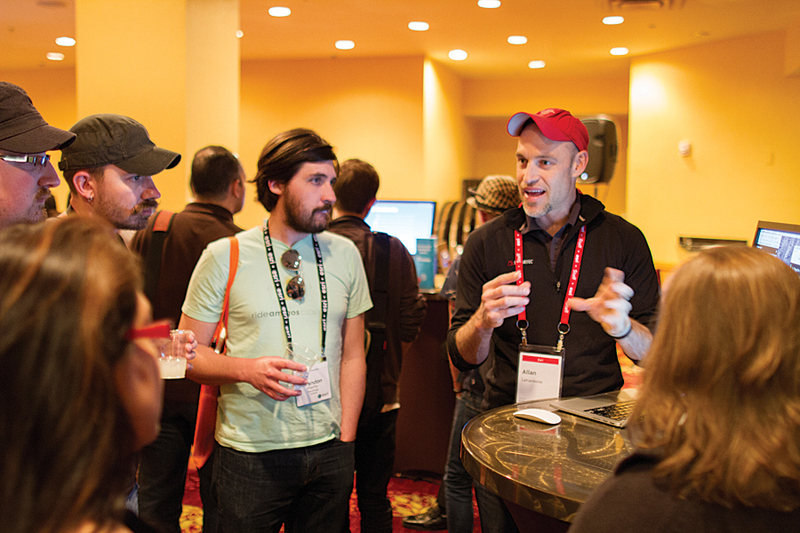 "DevSummit was a lifesaver in terms of getting me where I need to be in my understanding of [the Geotrigger Service] to integrate the SDK into my app," Roldos said. 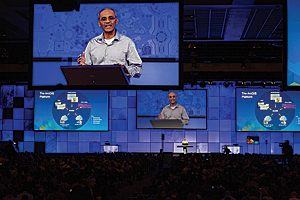 "The summit overall was very helpful for my project, my knowledge of what Esri makes available, and the amazing growth Esri is having in its developer platforms. It was clear that Esri is taking the lead in developing GIS for the next generation." 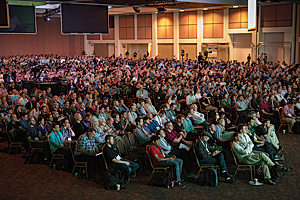 For him, the DevSummit is a must-attend event. "Being able to make connections with Esri developers and others creates a support network that would not be established otherwise," said Bostic. "The keynote [speaker] Chris [Wanstrath of GitHub], was a huge part of my liking the experience this year. His presentation style and talking points appealed to me. Also, the Innovation Lab is a good experience because you get to see cutting-edge stuff that makes light bulbs go off." "I was ecstatic to be surrounded by GIS nerds," she said. "No sarcasm there. I'm glad this field is really moving forward. Networking was quite easy and enjoyable. Although I'm only 22, I realize gaining this type of exposure at a young age is great!"